For one month every year, five highly competitive friends hit the ground running in a no-holds-barred game of tag they’ve been playing since the first grade—risking their necks, their jobs and their relationships to take each other down with the battle cry: “You’re It!” This year, the game coincides with the wedding of their only undefeated player, which should finally make him an easy target. But he knows they’re coming...and he’s ready. Based on a true story, the New Line Cinema comedy “Tag” shows how far some guys will go to be the last man standing. 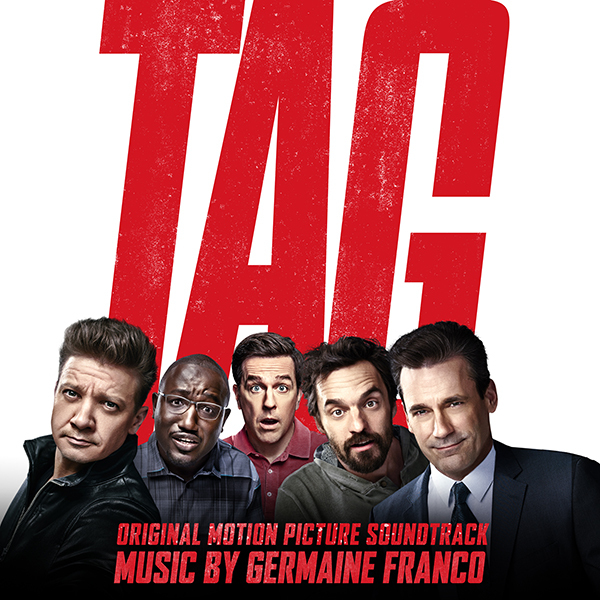 “Tag” is directed by Jeff Tomsic (Comedy Central’s “Broad City”), with a starring ensemble cast led by Ed Helms (The “Hangover” movies, “We’re the Millers”), Jake Johnson (TV’s “New Girl”), Annabelle Wallis (“The Mummy”), Rashida Jones (TV’s “Parks and Recreation”), Isla Fisher (“Now You See Me”), Leslie Bibb (“Iron Man 2”), Hannibal Buress (“Neighbors”), with Jon Hamm (“Baby Driver,” TV’s “Mad Men”) and Oscar nominee Jeremy Renner (“The Hurt Locker, “The Town”). GERMAINE FRANCO... Germaine Franco is the first Latina composer invited to join the Academy of Motion Picture Arts and Sciences, music branch. Franco is a versatile composer who creates music and songs that reflect her extensive training as an orchestral musician, an electronic music programmer, a multi-instrumentalist, and a lover of world music. Her upcoming project, Tag, directed by Jeff Tomsic for New Line Cinema and Warner Bros., is a hybrid score of electronica and action music. Franco collaborated with the filmmakers Lee Unkrich Adrian Molina, and Darla K. Anderson for four years as an additional composer, co-songwriter of “Un Poco Loco” and “Proud Corazón”, song producer, arranger and orchestrator. Germaine’s hip-hop and electronica score to DOPE, directed by Rick Famuyiwa (Open Road Films) premiered at Cannes and Sundance Film Festivals. Franco’s organic score for Tanya Saracho on Starz’ Vida includes indigenous Mexican chant, electronica, and latin music. Her immersive reality (4D) and theme park attractions include DreamWorks Animation’s, Motiongate and the upcoming DreamWorks Animation and Universal Creative’s Kung Fu Panda – The Emperor’s Quest at Universal Studios Hollywood, directed by Steve Hickner and Gary Trousdale.